Woo hoo! 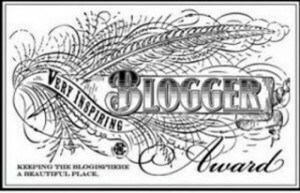 I've been nominated for the Inspirational Blogger Award by the wonderful, the fantastic, the oh-so-knowledgeable and puissant Diann T. Read. And by the way, if she hadn't already nominated me, I'd have nominated her. She's been extremely inspirational to me! 1. I've written 13 1/2 books in various stages of edit. 3. I danced the part of the Red Queen in the ballet Alice in Wonderland. 4. I recently won two silver medals in the Senior Olympics for swimming: 50m fly, and 100m breaststroke. 5. I have eaten rattlesnake, squid, octopus, possum, blood sausage, cricket, tongue, stinging nettles, cattails, head cheese, gyoza, wienerschnitzel, menudo, salmon roe/male bits, fishbait cheese, bone marrow, gizzards, frog legs, 100 year old eggs, and kimchee. There may be more I've blocked from my memory. 6. I have lived in four different countries and been to at least eleven. 7. I used to be in a folk dance troupe which traveled all over Europe. Notify those bloggers of the nomination and the award's requirements. Congratulations! I think you and your blog are very worthy of this recognition. And there was jubilation and dancing in the streets. And it came to pass that they did guzzle apple juice and eat vast quantities of chocolate and weep with joy. Well...it happened. I've been inducted into the Wicked Grouch Hall of Fame. (I'd say witch but I'm not one.) Someone dropped a house on me. I have the red and white striped socks and the black and blue and red and yellow bruises to prove my new status. And by the way, where the heck did my sparkly red shoes go, Dorothy? I'd had the flu. I was feeling like the inside of a salted slug--bad enough to keep me in bed past eight. So I was snoozing away when the dang phone rang. I don't believe in cell phones (myth) so it's the wall phone in the living room for me. It yelled at me insistently until I dragged my sorry carcass up out of my uncomfortable sick bed and lumbered in to answer it. On the way, I tripped over C's shoes lying in the hallway. Then the slow motion aerial ballet of errors began. I flew through the air, hitting the game cupboard with my collar bone and left arm, while my right arm and leg hit the bookcase. I was sitting in the living room pumping blood from my collar bone and the stupid phone was still going with the strident ringing. I finally crawled over and answered the sucker. I should have let the machine pick up. It was a stinking investment firm calling. Now I'm not a hater of all things investment-wise. It's just that these people always call for my husband, who actually works for a living outside the home. I work here, where the stinking phone rings. But they won't talk to me. They just hang up. So I've had it with rude investment beggars. That being the case, I yelled to the person to "STAY ON THE DANG PHONE!" I needed to get something to mop up my collarbone. Then I told them I nearly killed myself getting to the phone and might have broken my collarbone, so please would they stay on long enough to actually talk to me. Then the freak hung up. What he really did was give me ammo for the next phone call of this sort. Thank you, Rude Investment Bloke. I now have a way to avoid ever talking to your sort again. It's open season on phone solicitors...:o) I'm just waiting here, honing my plans into razor-sharp clarity, guaranteed to cause hours of rabid hilarity in the Murphy household. Meanwhile my body is technicolor everywhere and I missed going climbing at Rocks-n-Ropes because of you. Time to get the blood and maybe a chunk of bone off the game cabinet, Solicitor Man. Come on over, I've got a rag and some comet for you. I once TOUCHED a Rembrandt. Yeah. True story. It was in a museum in Berlin, Germany. I was there with my parents and a group of students we were shepherding around Europe. I was in the room without my parents (they'd moved on to other exhibits). I saw the alarm lines leading down to the picture and knew it was alarmed, and yet some little gremlin in my brain said, "It'll be freaky to say you'd done it! You're just touching it. Do it!" I reached up and touched a Rembrandt self-portrait. And then the alarm went off and several burly guards came running in shrieking at me in German. They were red-faced and one of them even spat at me while he was yelling. I just stood there hoping against hope that my parents wouldn't come flailing in to scream at me too. In fact, I just knew it would happen. I waited for the other shoe to drop, completely expecting to have the handcuffs clamped onto my wrists and be hauled off to a German prison as the sixteen-year-old art thief they knew me to be. And then they all left! They sloped off into the other room, where I heard them yacking about "the little girl in the other room who couldn't keep her mitts off the Rembrandts". I was so mortified! I WAS SIXTEEN FOR CRYIN' OUT LOUD! Couldn't they see I was clearly not a toddler? Then my logic cell kicked in and I stopped worrying about whether they thought I was old enough to drive and started being thankful that they weren't locking me in the klink. My parents, amazingly, only heard the alarm. They hardly even payed it another thought. They didn't ever knew that I was the culprit. I told my friends and we all had a laugh. I suppose they could blackmail me with it, if they weren't my dear friends. Because everybody knows touching artwork is the gateway drug to bigger, more dangerous endeavors, like College Humanities 101...shudder.